The most important game in the last round took place in Sakti between second ranked Pelita Jaya (4-4) and fifth ranked Bima Perkasa (4-5) on Saturday night. Pelita Jaya was defeated by Bima Perkasa in a tough game on the road 67-72. The best player for the winners was American forward David Atkinson (203-91, college: Salem Intern.) who scored 36 points (!!!) and 9 rebounds. The other American import guard David Seagers (188-88, college: Dowling) chipped in 15 points, 7 rebounds and 6 assists. At the other side the best for losing team was international forward Kore White (205-89, college: S.Florida) who recorded 17 points and 7 rebounds. Pelita Jaya's coach rotated ten players in this game, but that didn't help. Bima Perkasa moved-up to fourth place. Pelita Jaya at the other side keeps the second position with four games lost. They share it with Satria Muda. An exciting game between Top Four teams was played in Jakarta. First ranked Stapac faced one of their biggest challengers Satria Muda. Host Stapac (10-1) defeated guests from Jakarta (4-4) 85-78. It was a good game for American forward Savon Goodman (198, college: Shaw) who led his team to a victory with a double-double by scoring 15 points and 10 rebounds. Kaleb Gemilang contributed with 18 points and 5 rebounds for the winners. Stapac's coach Giedrius Zibenas allowed to play the deep bench players saving starting five for next games. American forward Dior Lowhorn (201-87, college: USF) replied with a double-double by scoring 31 points and 15 rebounds for Satria Muda. Stapac have an impressive six-game winning streak. They maintain first position with 10-1 record. Defending champion Satria Muda dropped to the second place with four games lost. They share the position with Pelita Jaya. Leader NSH delivered the seventh victory on Saturday night. This time they crushed 5th ranked Satya Wacana (2-8) 99-68 in Salatiga. Worth to mention a quality performance of Dashaun Wiggins who helped to win the game recording 22 points (perfect from downtown making all five shots). The best for the losing side was Raymond Miller with a double-double by scoring 17 points and 17 rebounds. The winner was already known earlier in the game, so both coaches allowed to play the bench players saving starting five for next games. NSH maintains first position with 7-3 record. Satya Wacana lost eighth consecutive game. They keep the fifth place with eight games lost. The most important game in the last round took place in Sakti between second ranked Pelita Jaya (4-4) and fifth ranked Bima Perkasa (4-5) on Saturday night. Pelita Jaya was defeated by Bima Perkasa in a tough game on the road 67-72. The best player for the winners was American forward David Atkinson (203-91, college: Salem Intern.) who scored 36 points (!!!) and 9 rebounds. The other American import guard David Seagers (188-88, college: Dowling) chipped in 15 points, 7 rebounds and 6 assists. At the other side the best for losing team was international forward Kore White (205-89, college: S.Florida) who recorded 17 points and 7 rebounds and the former international Xaverius Prawiro (182-86) added 11 points respectively. Pelita Jaya's coach rotated ten players in this game, but that didn't help. Bima Perkasa moved-up to fourth place. Pelita Jaya at the other side keeps the second position with four games lost. They share it with Satria Muda. An exciting game between Top Four teams was played in Jakarta. First ranked Stapac faced one of their biggest challengers Satria Muda. Host Stapac (10-1) defeated guests from Jakarta (4-4) 85-78. Stapac forced 19 Satria Muda turnovers. It was a good game for American forward Savon Goodman (198, college: Shaw) who led his team to a victory with a double-double by scoring 15 points and 10 rebounds. International Kaleb Gemilang (183-91) contributed with 18 points and 5 rebounds for the winners. Five Stapac players scored in double figures. Stapac's coach Giedrius Zibenas allowed to play the deep bench players saving starting five for next games. American forward Dior Lowhorn (201-87, college: USF) replied with a double-double by scoring 31 points and 15 rebounds and international forward Jamarr Johnson (193-88, college: Widener) added 27 points and 9 rebounds in the effort for Satria Muda. Stapac have an impressive six-game winning streak. They maintain first position with 10-1 record. Defending champion Satria Muda dropped to the second place with four games lost. They share the position with Pelita Jaya. Leader NSH delivered the seventh victory on Saturday night. This time they crushed 5th ranked Satya Wacana (2-8) 99-68 in Salatiga. 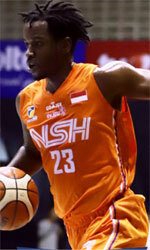 NSH forced 23 Satya Wacana turnovers. They looked well-organized offensively handing out 29 assists comparing to just 11 passes made by Satya Wacana's players. Worth to mention a quality performance of American guard Dashaun Wiggins (188-91, college: Portland St.) who helped to win the game recording 22 points (perfect from downtown making all five shots) and point guard Andre Rorimpandey (177-96) who added 17 points, 5 rebounds and 5 assists during the contest. Four NSH players scored in double figures. The best for the losing side was American forward Raymond Miller (204-88, college: CS Fullerton) with a double-double by scoring 17 points and 17 rebounds and Andre Adriano (175-94) scored 13 points. The winner was already known earlier in the game, so both coaches allowed to play the bench players saving starting five for next games. NSH maintains first position with 7-3 record. Satya Wacana lost eighth consecutive game. They keep the fifth place with eight games lost.